Traveling unconventionally is amazing, as you get to experience everything in a different way. From the way you travel to the way you get to see new locations that you decide you explore, every single element is taken to a whole new level. Traveling by car, van, bike, motorcycle, sleeping in a tent or in your own van, these are all non-traditional ways of experiencing new places and enjoying every single moment of them. However, if you are one of those people who don’t like to give up their basic comfort, such as washing whenever they feel like it, you will need a few accessories that are capable of making your life easier. A portable water heater is a tank that is capable of heating the water so that you can wash yourself, your dishes or your clothing whenever needed. Most of these products have auto ignition mechanisms that start the heating process immediately after the water stream enters the system. Some of these products work using gas and some are electric. Choosing the best water heater for your needs is crucial, if you want to keep your costs low and increase your comfort. Water heaters that are designed to be used outdoors are highly portable. They are small, compact and very practical. They fit in the back of the car and anywhere in a van. However, it is a bit more difficult to carry them if you decide to travel by motorcycle. The market is rich in portable water heaters. Some models come with regular tanks, while others are tankless. If you are planning to go on vacation soon and you want to buy such a product, but you aren’t sure which one is best for your needs and budget, then you should start analyzing the five products below. We have selected the five most-popular ones and highlighted their pros and cons, to help you make the wisest decision. Bosch is a brand that is well-known for its high-quality, durable products. When it comes to water heaters, the manufacturer maintains the stakes high and offers its consumers products that satisfy their needs during their travels. 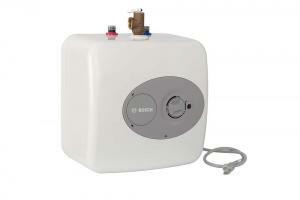 The Tronic 3000 model is a mini-task water heater with a capacity of 4 gallons, measuring 13.75 x 13.75 x 13.50 inches. It fits perfectly in the back of the car or anywhere in a van. It is an electric product that comes with a glass-lines tank that ensures its durability. It includes a 36-37 inches long cord that can be plugged into a 120 Volt outlet. Therefore, anytime you need hot water, you can plug it in and create an in-line installation. This water heater can be mounted on a shelf, a wall or on the floor in case you are thinking about using it for a vacation home where the space is quite limited. Also, it can be used in basements, powder rooms, garages or boats. Its energy efficiency is given by the CFC free foam insulation. The water pressure that it can offer is 150 PSI, while the temperature range is 65-145 degrees F. This product is covered by a 6-year limited warranty for the inner tank and a 2-year limited warranty for other components. It weighs 22.9 pounds, which makes it easy for you to transport it whenever needed. 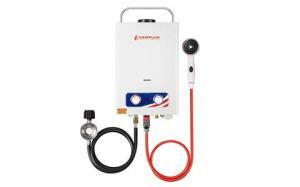 Camplux brings to the market an even more affordable water heater that runs on propane. This product is great for camping and vacations at the mountainside, as it is capable of heating the water instantly. It is equipped with an oxygen depletion sensor protection and it can be installed indoors if the room is properly ventilated. The ignition can be turned on using 2 D cell batteries. This model only needs 2.5 PSI of water pressure and it works great with water pumps. It can reach a maximum temperature of 114.8 degrees F and a minimum of 46.4 degrees F for 1.32 GPM. The 5L Camplux model has a compact size, it is easy to transport and install. It has a lot of safety features, including overheat protection, anti-frozen, low water flow, flame failure, dry combustion and high water pressure protection. 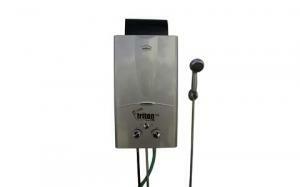 It includes wall mounting brackets, a CSA certified regulator, a portable handle and an air outlet. Its burner is made of stainless steel, while its heat exchanger is made of copper and is heat-resistant and anti-corrosion. It can heat 1.32 gallons of water per minute at 110 PSI. This product measures only 11.4 x 5.5 x 14.6 inches and weighs 10.8 pounds. Another water heater that is both affordable and highly practical has been developed by Camp Chef. This 23 x 13.4 x 8 inches product is ideal for camping, as it is portable, easy to install and use and will not take much of your car’s space. It is made of steel and it can produce 1.5 gallons of hot water per minute. The heat and water flow are adjustable. Also, it includes a shower head that has the following settings: off, mist, shower and jet. Its water hose is included and measures 96 inches. It is not imperative to hang this portable water heater. It comes with brackets, so that you can install it on a wall, but it is also safe to use in a standing position. The HWD5 model has a carrying handle that makes it easier to transport. It folds down when not being used, so it will not stand in your way. In order to function, it needs water pressure between 25-30 PSI. Its maximum pressure is 80 PSI. It works on batteries; however, these are not included, so you will have to buy two D batteries separately. This product was mainly designed for camping, but it can be used successfully for horse care, car wash, kid pools, tailgating or dog washing at any time, as long as the pressure from the input hose is right. More than that, it is equipped with a regulator hose for bulk propane tank, so you don’t need to worry about that, either. If you liked the first Camplux portable water heater but you would like to see a different model with slightly different specifications, then this might be a good option for you. This product has the same design as the previous one, being compact, lightweight and very easy to carry. It can be used even with water pressure as low as 2.8 PSI and it can produce up to 1.58 gallons of hot water per minute. The great thing about these products from Camplux is that they are energy efficient. 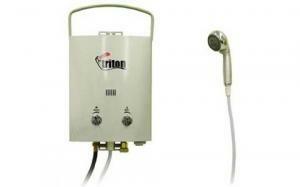 While using such a camping water heater, you will be observing that the energy consumption is better optimized. With regards to the temperature that it can reach, it has a maximum raise of 46 degrees Celsius and a minimum of 8 degrees Celsius, for 1.58 gallons per minute. You might want to go for this product if you need a portable water heater that has plenty of safety features. Giving the fact that it runs on propane, it is only natural to want to stay as safe as possible. Therefore, you will be glad to know that it is equipped with a flame failure device, anti-freezing protection, oxygen depletion safety and shut-off protection. The last product on our list is pricier than the previously described portable water heaters, yet it offers a larger capacity. This 10-liter model can heat up 2.6 gallons of water per minute on demand and has a shower head with four settings: off, mist, shower and jet. It works on batteries and requires two type D ones that are not included in the box. It has a carrying handle which makes it easy to transport, but it also has brackets that can be used for wall mounting. Also, it includes a regulator hose for bulk propane tank and an 8 foot water hose. This heating unit automatically starts when the water is turned on. It is larger than the previous similar products, measuring 31 x 16 x 9.2 inches and weighing 27.6 pounds. Although this is a great product, it has a few down-sides, such as the fact that it isn’t windproof. This means that if you choose to use it outdoors in a windy area, it will shut-off quite often. At the same time, it doesn’t have an automatic shut-off function, so you have to turn it off manually whenever you don’t use it in order to prevent energy waste. If you are looking for a larger portable water heater, this is one of the best options, although it is not a product with advanced features. Portable water heaters are extremely practical devices that help you bring the comfort that you need anywhere you go. If you love to go camping in remote areas where you can’t find any showers, then owning one will make your life so much easier. Of course, trying to become one with nature is amazing, especially when camping near clear waters, such as lakes or rivers, but you shouldn’t take risks. Sometimes, the weather is unpredictable and other times you simply have no choice but to buy a water heater, especially if you travel with children. More than that, dish washing cannot take place properly without any hot water. Investing in a portable water heater is the best thing that you can do for yourself and your family if traveling unconventionally has become a habit. Modern such products are affordable, small-sized, lightweight and very easy to use. Choose the most practical one for your needs, depending on your personal preferences.